Working in close liaison with the Young Historian Project, the Trust awards annual prizes for essays submitted by schools throughout the country relating to World War 2 events and their historical significance. Deadline for entries is Mid July. Perhaps you know a school who has already done some work/ plans to do some work on this and could therefore submit their work. Further details on the categories and submissions can be found here. We have been approached by a film company based in France who would like to interview veterans who fought against the 12th SS Panzer Division, particularly in the battle for Caen. Julien Johan (director of Children’s war, 2018) is preparing a historical documentary film. Produced by ZED, it will be broadcast on the main national public broadcaster, France 2. Zed is also in discussion with National Geographic. We have no editorial control over the making of the film and cannot guarantee the line that the makers will take. If you would be interested in participating in the filming please feel free to contact them direct via email chratiney@gmail.com or on mobile phone +33687295708 to speak to Christiane Ratiney assistant to the director of Zed productions. The event was attended by Ian Stewart CM, Vice Chairman of SONT and Veteran Mervyn Kersh Leg.d’ hon. Mervyn was accompanied by his daughter Lynne and the launch was hosted by Maxine Cannon. The IOM Post Office Isle of Man Post Office has presented a set of eight stamps commemorating the 75th anniversary of the Battle of Normandy. BBC Wales are keen to contact any Welsh Normandy veterans to record personal interviews of their involvement in the Normandy Campaign. The plan is to archive the recordings as an oral history record. 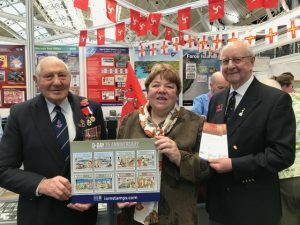 The Spirit of Normandy Trust arranged for a group of four veterans to meet with Royal Mail to review the proposed designs for a stamp issue to commemorate the 75th anniversary of D-Day. 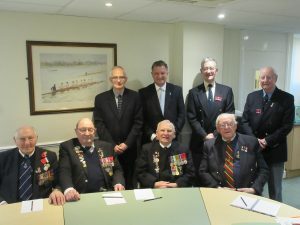 The photograph shows the veterans, Trustees from the Spirit of Normandy Trust and officials from Royal Mail. It was a very constructive meeting with a good exchange of views. Look out for the stamps when they are issued in June.